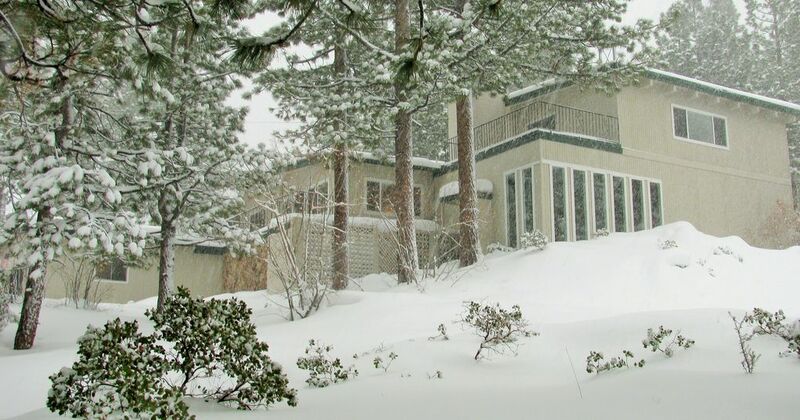 This mountain ski house is located 4 blocks from Heavenly Ski area on approx 1/2 acre and has lake and mountain views..Call Owner at 805-317-1580..also a view of Heavenly's 'Gunbarrel' ski run. This 5 bedroom, 4 bath, 2 car garage nonsmoking / no pets home is almost 4,000 sq. ft.& full of amenities, inc stone entryway with vaulted ceiling and 8' windows, game room with professional grade pool table and leather couches, and a 55' LCD TV w/ multichannel HD cable, DVD & VCR. Fully equipped kitchen and dining area that seats 12, plus a large back deck with 6 burner Weber gas grill, hot tub & more seating. The living room has comfortable couches, skylights, fireplace, 42' flat screen TV & poker table. The house has 4 TVs, 3 decks, 2 with lake views, 1 wood burning stove, and 1 gas fireplace & is entirely WiFied for your convenience. Upstairs: The master bedroom has designer bed linens on a king bed, Seating area with couch, chairs and desk and deck with views. Large master bath with double sinks, glass enclosed shower and sunken tub, separate commode area, changing area and large closet and built in drawer space. Main Floor: Living room with views and deck access, wood and gas fireplaces, dining tables seating 12, kitchen and family room access, 2 Bedrooms w/King Beds, designer bed linens, large closets, ample drawer space, one with ensuite bath and the other with a bath just outside the door. Downstairs: 2 bedrooms with shared bath. One with twin beds. The other has a full bed/ twin bunk bed and separate full size bed. Garage access on this floor. We love the Tahoe area and are avid skiiers. We wanted to be close to a ski resort and found a house 4 blocks from Heavenly which was perfect for us. We were pleasantly surprised at how much we enjoyed the rest of the year at the house due to its central location. Within a mile of the lake, we can be at our favorite beach in minutes and have 5 of the best restaurants in Tahoe within a mile as well. The views from the hiking trails are spectacular and the large number of golf courses in the area keeps my husband busy. There is always something to do here, but we mostly enjoy just relaxing in our home. With almost 4,000 feet of interior space and 3 exterior decks there is room for everyone to choose how to spend their time when they are not out and about in Tahoe. We chose Tahoe because it had the perfect combination of snow and sun fun. We also wanted a place that our grown children would want to visit and bring their friends to visit as well. Tahoe has something for everyone and we have enjoyed family reunions, birthdays, visits with friends and relatives. We wanted the beauty of a Lake Tahoe with all its amenities and a comfortable home that we could enjoy along with our guests. Master Bath in Bear's Den is huge. 2 lg. sinks w full wall mirror, separate toilet closet, large sitting area in tub/shower area w skylight. Vanities and commode area are travertine tiled. Moose Bdrm bath is complete with new porcelain tile while the shared bathroom for the Steamboat Bdrm and the Bunk/twin Bdrms are sink/toilet/shower. Watch the Tahoe Queen leave Ski Run Marina and make its way to Emerald Bay, the paraskiers on the lake or the sailboats. Enjoy watching the skiers in the morning from the large back deck and in the evening slip into the hot tub and watch the lights of the snocats grooming the mountain for the next days runs. Located in the Living Rm. Large dining table that seats 12 at once. Adjacent breakfast counter with 2 seats. (7) TV in every room and enjoy 2 flat screens with HD for a great Football, basketball, golf and BluRay for movies. V. large balcony off top floor master bdrm. Just 4 blocks from the California Lodge at Heavenly. This spacious ski house is perfect for your winter vacation. 3 King Beds, 2 Double Beds, 3 Twins. 2 big screen TVs; 2 fireplaces; 3 decks; lg. barbecue; pool table; poker table; views of Lake Tahoe on 2 front decks and Very Close proximity view of Heavenly Ski Area on back deck. Only 5 minutes to the casinos, 2 blocks from Heavenly Valley - largest ski resort in the West..Call the Owner at 805-317-1580...walking distance, 2 minutes from South Tahoe's largest marina-includes boat rentals, jet ski rentals, & beach. (Home of the Tahoe Queen paddle boat-which has romantic cruises/ dinners); 3 minutes to Tahoe's only year-round hockey-size indoor ice skating rink & indoor swimming pool. Also, close to 5 golf courses, hiking, biking and horseback riding. Either way, you are close to all the excitement Tahoe can offer. Main floor (Split level): Entry way, conversation area; Gameroom - pool table, 2 sofa beds; family room, poker table, 1 sofa bed, wood stove fireplace; dining area; kitchen; 'Moose' bedroom (king bed)& full bath while 'Steamboat' bedroom (king bed)has a bathroom just outside door; mudroom (washer/ dryer), Front & rear decks (for viewing the lake and surrounding mountains), gas grill, hot tub.